Wednesday, 12th Jun 2013. Palm oil futures manage to record some gain yesterday after it rose from previous Monday low around 2,440 level. Other news to follow. "-U.S. stocks declined Tuesday afternoon after the Bank of Japan opted to hold its monetary policy steady, disappointing those looking for a quick hit of expanded stimulus. The Federal Open Market Committee and Fed Chairman Ben Bernanke "have introduced volatility into the market for the first time this year, and part of it has to do with when quantitative easing will start to taper, and that has caused a cascade of opinions as to when that will be and what that should mean for stocks," said Art Hogan, market strategist at Lazard Capital Markets. After rising as much as 12 points and falling as much as 152, the Dow Jones Industrial Average DJIA -0.76% fell 116.57 points at 15,122.02. The S&P 500 index SPX -1.02% shed 16.68 points to 1,626.13. The Nasdaq Composite COMP -1.06% lost 36.82 points to 3,436.94." "-Japanese stocks fell on Tuesday after the yen strengthened following the Bank of Japan’s policy meeting, while a decline in Samsung Electronics weighed on the South Korean market. The dollar continued its march against a number of Asian currencies, after Standard & Poor’s upgraded its ratings outlook on the U.S. to stable from negative on Monday, citing the country’s strong economic performance. South Korea’s Kospi CompositeKR:SEU -0.23% declined 0.6% to 1920.68, with the index weighed by its single largest constituent, Samsung Electronics Co. KR:005930 -0.43% SSNLF -0.36% , which lost 2.5% on concerns that its Galaxy S4 smartphone may not be selling as well as expected." "-Oil futures closed lower on Tuesday following a downbeat monthly forecast from the Organization of the Petroleum Exporting Countries. Crude oil for July delivery CLN3 -0.58% shed 39 cents, or 0.4%, to settle at $95.38 a barrel on the New York Mercantile Exchange, but finished well off its session low." "-July Soybeans finished up 28 3/4 at 1540 1/2, 3 1/2 off the high and 25 3/4 up from the low. November Soybeans closed up 8 at 1327. This was 13 up from the low and 2 1/2 off the high. July Soymeal closed up 15.1 at 463.4. This was 14.0 up from the low and 2.7 off the high. July Soybean Oil finished down 0.03 at 48.04, 0.3 off the high and 0.08 up from the low. July soybeans traded up double digits on the day along with the July/November soybean spread. Meal had a strong day of trade as interior cash markets strengthen on steady demand. Soybean basis levels held steady in processor markets but there continues to be lingering doubts as to just how much old crop supply is left in the farmer's bins. A well-known oilseed analyst estimated that they expect the global soybean crop to increase by 18% in the year to 284 million tonnes with larger production out of the US, Brazil, and Argentina. The production rebounds were contingent on weather patterns for the growing season. Port union workers in Argentina announced that they may go on strike this week due to discrepancies with the government. There was the potential for farmers to halt any further soybean sales as well which might have helped support July soybeans and meal today." FCPO- Where It Stand, Currently. Palm oil futures is not even standing at any cross road as most of the traders think it would after two sessions of ranging trading day this week. The market might be hesitating to breach the previous high at 2,471 but it may not mean that the rally is over. 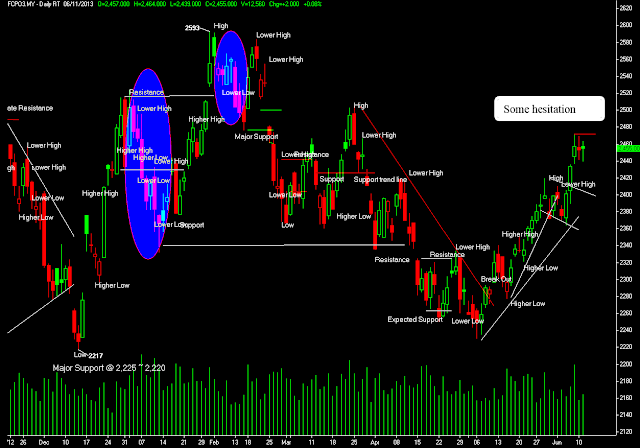 The benchmark Aug has retraced slightly from the peak but the Bulls are yet giving up fight to the Bears. We have some panic moment when the Aug contract dipped below 2,440 support level to 2,439 yesterday but strong Buying interest resurface and overcome Selling pressure throughout the closing bell. Where do we stand after the market has rallied for 10.8% from 2,230 on early May. The answer, we are doing well so far with just some market hesitation for the moment. Trading participants are probably held back to push up the price due to Bearish outlook on Soy oil. The record high crop on Soy oil seems to prolong market weakness and it was estimate that farmers are planting more than usual, threatening to Soy oil reserves to spike up two times additional to current stockpiles. Technically, there is no significant sign for the Aug contract to make any major correction yet unless it swiftly breached below 2,439 again this week. Else the benchmark Aug is likely to trade within these support and resistance range, 2,470~ 2,440. For today, pivot support for the benchmark Aug is located around 2.441 while resistance is pegged at 2,466~2,477 area.